RECAP: BU Beats BC in first installment of the Battle of Comm. Ave. 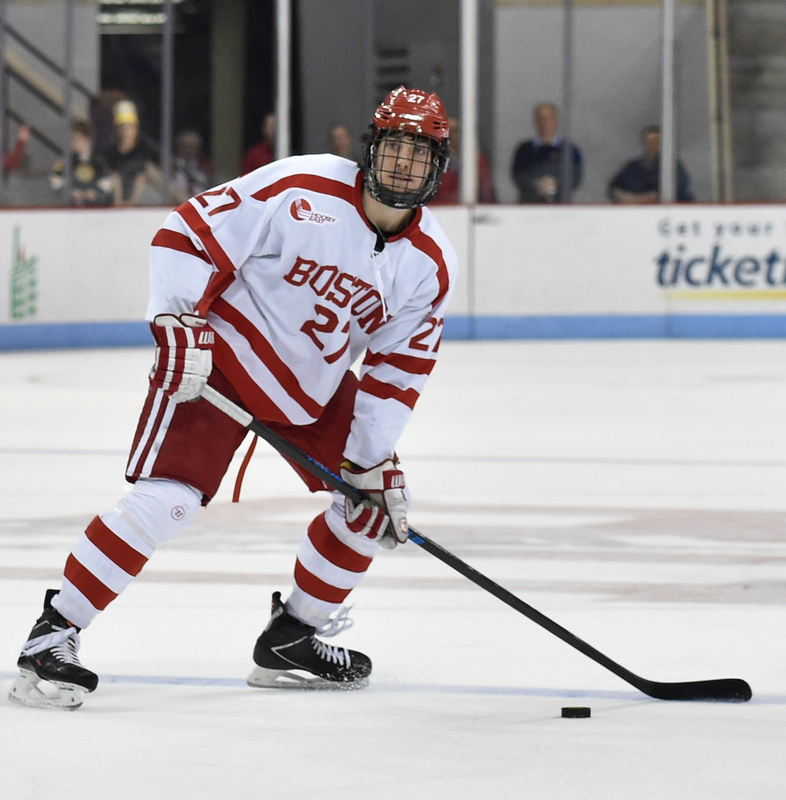 The third period was shaky as can be, but Boston University held on against Boston College on Friday night at Agganis Arena, earning a 2-1 in the process. The scoring got underway in the second period, when Jakob Forsbacka Karlsson tipped home a shot from Dante Fabbro. BC answered right back, though, with Colin White banging home a power-play goal with ease. Looking to regain the lead, Clayton Keller scored the ultimate game-winner as provided by Jordan Greenway. For a full recap of the night’s affairs, check out Jonathan’s recap over on The Daily Free Press. Outside of the goalscorers, this game was always going to feature an elite battle of goaltenders. On one side it was BU’s Jake Oettinger, and on the other BC’s Joseph Woll. They both featured on Team USA’s 2017 World Junior Championship squad that last week secured a gold medal. For more on that clash, check out Jonathan’s sider over on The Daily Free Press. New B1G proposal: Greenway and Keller cannot be on the ice at the same time. 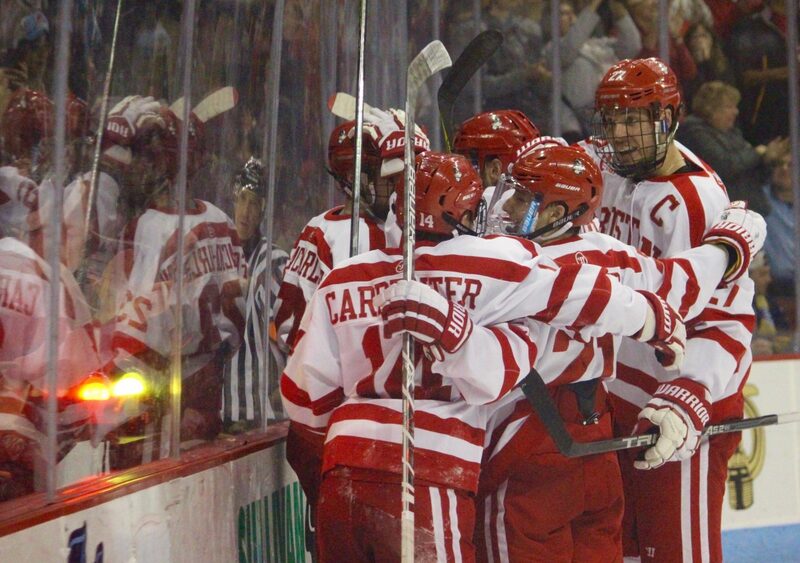 Here are videos of interviews following BU’s 5-4 win over Union. The one with Coach Quinn was cut short to conduct an interview with Doyle Somerby outside of the Terriers’ locker room. LOWELL — Both head coaches after Game 1 of the Hockey East Quarterfinals agreed that the contest came down to one thing — special teams. But as Boston University head coach David Quinn noted, the other team executed and his team didn’t. In what was a tight game throughout the full 60 minutes, No. 11 University of Massachusetts Lowell pulled ahead to stay with two third-period goals, defeating No. 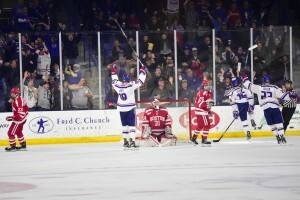 8 BU, 3-2, at the Tsongas Center on Friday night. The decisive goal for Lowell (22-8-5) came off the stick of forward Adam Chapie, a power-play strike with 4:38 left in the final period. Bounces one way or the other could have changed the outcome of this one, as things tend to happen in playoff games. Puck luck remained mostly on the side of Lowell on Friday, but we’ll explore the negatives and positives a little further in this Pluses and Minuses. It’s noted early in the piece, and for good reason, as the respective power plays were the difference. 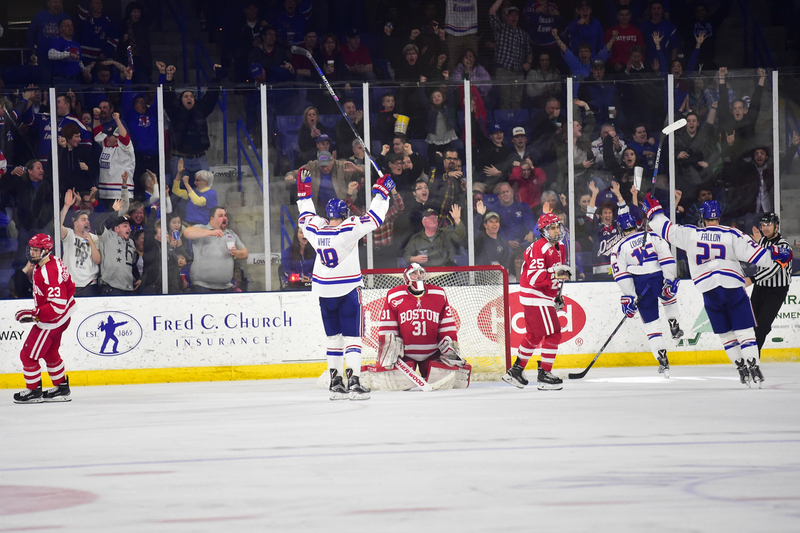 To briefly summarize, BU (21-11-5) went 0-for-2 with a man up, while the River Hawks did their part on the power play, finishing at a 50 percent clip (2-for-4). We could probably break this down for hours, but, in short, BU’s effort on special teams was just not good enough to win a hockey game, especially one of this magnitude. But, if you want to read more about the issues on special teams, Sarah has your back in her sidebar. Quinn said after the game that he liked the way his team played 5-on-5, and for the majority of the game, BU did indeed play well at even strength. One mishap in the neutral zone, however, proved costly halfway through the third period. The Terriers pressed in Lowell’s end for most of the third, but the River Hawks took advantage with space in neutral ice, converting on forward Michael Louria’s goal at 11:35. Louria got the puck through the neutral zone and into the high slot uninhibited, allowing him to wrist a shot in the low corner of the net, under senior goaltender Sean Maguire‘s blocker. Louria said his shot hit a stick in front of him, which helped him score, but any way you put it, a well-placed shot in open space is a tough matchup for any goaltender. The shots were there but the goals were not. BU racked up 35 shots, including 18 in the final 20 minutes of play, as compared to Lowell’s game total of 19. BU outshot Lowell by six in the first, but skated to the dressing room in a scoreless tie, which Quinn noted was frustrating. 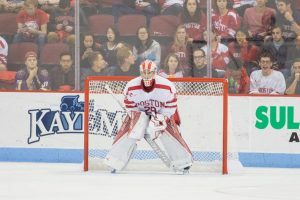 Yet, even as BU pressured goaltender Kevin Boyle in the final minutes, he continued to make all of the necessary stops to prevail in the series opener. In two of the three games that BU has faced Lowell this season, Boyle has limited the Terriers’ to three or fewer goals. 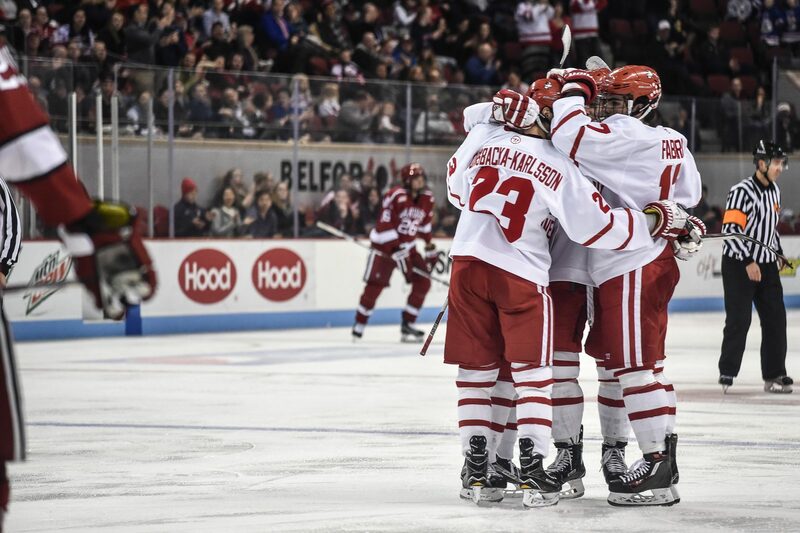 It could very well be a product of playing good defenses (and strong goaltenders), but BU has scored more than three goals in a game only twice since February, both against last-place University of Massachusetts Amherst. Scoring three goals should be enough to win you most hockey games, but for a team that scored at a good pace in the first half, goals have been harder to come by over the last two months. In such a fickle game like hockey, scoring can come and go in bunches. Example — freshman center Jakob Forsbacka Karlsson. 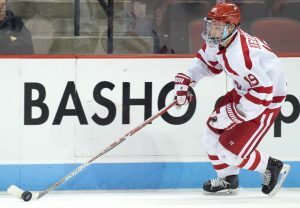 BU’s first-line center proved early in the year to not only have adept passing skills, but he had some scoring touch, with seven goals through Jan. 22. But good streaks can lead to empty ones, and Forsbacka Karlsson felt that through much of February and into early March. The freshman had no goals and just five points in a 12-game stretch lasting from that Jan. 22 game through March 4. 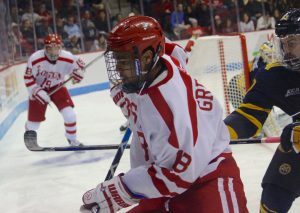 Finally, in the second game of BU’s first-round series with UMass (8-24-4) he broke through with two goals. 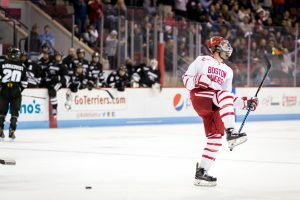 He continued that scoring against Lowell, tallying BU’s first of the night early in the second period, walking in from the left circle and beating Boyle five-hole on a quick wrister to open up the scoring at 6:22. Moral victories mean almost nothing when it comes down to the postseason, but there is something that BU can at least take some solace in after Friday’s loss. If there’s one thing Quinn’s bunch has done exceptionally well the past two seasons, it’s that it hasn’t lost two games in a row very often. In fact, since last year, the Terriers have only lost back-t0-back games just once, and that came early on in this campaign on Oct. 27 and 30 in games against the University of Connecticut and Merrimack College. 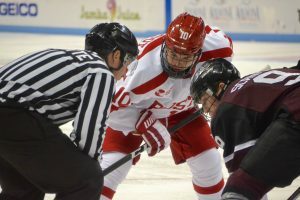 The University of Massachusetts Amherst struck first on Saturday evening at Agganis Arena, but the Boston University men’s hockey team quickly righted the ship en route to a 7-2 win. Senior defenseman Matt Grzelcyk stole the show and the World Juniors contingent impressed, serving as the highlights on a nearly seamless evening. Below are several positives and negatives from two crucial Hockey East points. The Charlestown native scored a natural hat trick, showing how big of an impact he can have on this team. Read more about his influence in Judy’s sider. After rattling off successive wins against Quinnipiac University and Harvard University, the Minutemen admittedly were going to pose a lesser threat in Maguire’s third straight start. Nonetheless, UMass still peppered the senior goaltender to the tune of 27 shots, and it took opportunistic finishes from Shane Walsh and Steven Iacobellis to light the lamp. There is no denying that Maguire is getting into a groove, and that bodes extremely well for the Terriers with Boston College on the horizon next weekend. Just ask Grzelcyk, who has embarked on a collegiate journey with Maguire and rests easy knowing his classmate is between the pipes. “Any time you get a goaltender who’s kind of hot right there, it kind of allows you to play more aggressively just knowing you have that confidence back there and he’s looked incredible in net, so we’re definitely happy to have him back,” he said. Head coach David Quinn didn’t shy away from praise either, highlighting the rejuvenated goaltender’s gradual journey back to confidence and composure. Less than a week removed from the World Junior Championships in Finland, it’s already clear that Brandon Fortunato, Charlie McAvoy, Brandon Hickey and Jakob Forsbacka Karlsson have benefited from their international experience. JFK ignited the scoring onslaught with a heads-up play behind the net, Fortunato grabbed an assist on Grzelcyk’s second tally, McAvoy nabbed two helpers of his own and Hickey maintained a solid defensive gap throughout the contest. That’s just what stands out about their respective nights, though. 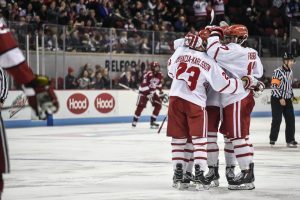 As anybody close to BU hockey will echo, all four play beyond their years and their importance becomes more tangible as the Terriers round into form. When a team wins by five goals, it’s easy to overlook the small details that add up over the course of a hockey game. That’s exactly what can happen with a team’s penalty kill, and the Terriers took care of business in that department on Saturday night. UMass, which capitalizes on just 17.1 percent of its power plays, was kept off the board when it had a man advantage. To be exact, the Minutemen went 0-for-4 and were limited to only two shots on target across all eight minutes. As mentioned above, BU fell into yet another early hole, letting their opponent grab an early lead that could’ve gotten out of hand if not for some shrewd plays in the offensive zone. That’s a trend that becomes even more perilous when a top-ranked opponent comes to town or everything is on the line in a playoff scenario. Still, Quinn was pleased with how his team responded in adversity and grabbed ahold of the proceedings when the odds were stacked against them. It took a bit of a wake-up call from head coach David Quinn, but the No. 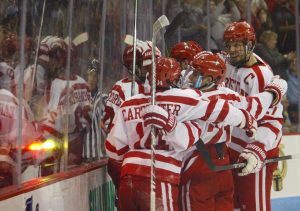 11 Boston University men’s hockey team managed to salvage the second half of a home series against the University of Vermont. After falling behind 2-0 early, and then again facing a 3-2 deficit late in the third period, goals from senior assistant captain Matt Lane and sophomore defenseman Brandon Hickey, plus a last-second empty-netter from sophomore defenseman Brandon Fortunato, secured the 5-3 victory for the Terriers. We were admittedly skeptical at first about Quinn’s changes to the lines, but they worked well — at the very least, the changes helped “to wake up the whole team,” in the words of senior forward Ahti Oksanen. Oksanen, after playing on the first line for most of the season, was bumped down to the left wing on the second line, alongside Lane and freshman forward Jordan Greenway. Sophomore forward A.J. Greer moved up to the first line, alongside freshman center Jakob Forsbacka Karlsson and senior right wing Danny O’Regan. He recorded a secondary assist on O’Regan’s early goal. BU recorded a season-high 51 shots on goal, behind six players who recorded four or more shots. Oksanen led the way (shocker) with eight shots, while Hickey and freshman center Bobo Carpenter had seven shots on goal apiece. After going 1-for-13 on the power play in its past four games entering Saturday — and a night after Quinn called the PP unit “lazy” — BU had a much more impressive showing on the power-play unit. “There was more urgency, we were shooting it, we looked like a power play,” Quinn said. “There was a heightened awareness…We, too often, go into power-play mode and think it’s going to be a beauty contest. “The bottom line is you’ve got to get pucks to the net, you got to pass it quickly, you got to pay attention and you got to crash the net. There’s really no other way to go about it, so I thought we had a lot more simplicity to our power play tonight. Just to clarify: there was a bit of confusion as to exactly how many power-play opportunities BU technically had. Because Vermont winger Brady Shaw was sent off with a game misconduct, after Hickey scored a power-play goal, the Terriers remained on the man advantage — thus, technically, giving BU a fifth power-play opportunity after that. 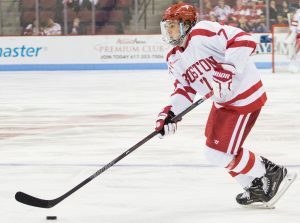 Then Fortunato scored the empty-netter on BU’s next man advantage. After Fortunato’s empty-netter, there was no faceoff, since the teams were already retreating to the locker room, but those remaining 0.3 seconds apparently technically counted as a new power play for BU, even though nobody touched the puck after Fortunato’s goal. I just used “technically” a lot in that description, but…you get the idea. “2-for-6” is a bit deceiving. Regardless, it was a much improved showing from the Terriers. Well, we couldn’t help but give Carpenter a shoutout for that very fact. Today, he went 6-for-6 on faceoffs, but he currently leads the conference in faceoff percentage, with a .679 mark. Forsbacka Karlsson went 14-5 on his draws, while Lane went 12-8. As a whole, BU won 38 of 60 faceoffs. Strong finish to first half? In the final home game of 2015, the Terriers were able to escape with a win. It’s the final time they’ll play at Agganis until Jan. 9. After the game, Lane stressed the importance of BU concluding the first half of Hockey East play with a win. Quinn stressed the importance of the seniors’ leadership in this game. You can read more about that in Andrew’s sider. That part I mentioned earlier about thinking early on that we’d have to be grumpy in these pluses and minuses? Yeah, we’re at the grumpy point now. Two goals today came for Vermont off of bad, bad, bad turnovers on BU’s part. The first was on the goal that allowed the Catamounts to take a 2-0 lead in the opening period, when sophomore defenseman John MacLeod gave up the puck to Vermont forward Mario Puskarich behind the net and Puskarich was able to convert. Later in the third period, with the game tied 2-2, freshman defenseman Charlie McAvoy mishandled a pass from Hickey right in front of BU’s net. He left the puck up for grabs directly in front of sophomore goaltender Connor LaCouvee, and Catamount forward Anthony Petruzzelli took full advantage of it. Oksanen, a former defenseman himself, noted the slip-ups in the defensive zone. Yet again, BU fell to a 2-0 deficit early before having to put together the comeback it did. While the Terriers have been able to more or less come away with wins and ties this season, it’s certainly not a habit they want to keep falling into, as Lane noted. After Lane scored the game-tying goal, it was announced that the goal counted for his 100th career point. Agganis Arena erupted into an ovation, but soon thereafter, a correction was issued. It was actually Lane’s 50th career point.